Anyone who knows me knows that “gratificazione immediata” (instant gratification) is my basic operational mode. Patience is not my strongest suit. Owning two houses for more than a year – and a closing that took three full days to end that – did build my patience muscles a bit, but alas I think they’ve atrophied since then. So let me just say that nine years is quite a while to wait for something. What’s the something? Gloves. Beautiful gloves. Elegant gloves, Gloves that make you feel like you’re channeling Jackie… or Audrey… or Grace… or my beautiful mother, Nancy. On my first trip to Italy in 2002, I stumbled upon the most amazing, tiny, charming little shop in Firenze called Pusateri. Imagine a shoebox-sized shop, staffed by two elegant Italian ladies, with floor to ceiling cubbies filled with every color (and size) gloves imaginable. Red, blue, violet, pink, yellow, chocolate brown, green, orange. If you can visualize the color, it’s probably there. The day of my initial Pusateri discovery happened to be in the middle of a record-setting heat wave in Firenze. The thermometer hit 100 degrees Fahrenheit that day. But no matter. I was not going to pass up the chance to shop for gorgeous Italian gloves at a remarkably affordable price. And so I was introduced to the proper way to purchase gloves. The clerk assisting me put a velvet pillow on the glass counter and instructed me to place my elbow on the pillow with my arm perpendicular to the counter. She then powdered my hand (yes, powdered) and proceeded to try various gloves on my hand to ascertain my correct size and to allow me to see what style and material I preferred — suede or leather, for example. 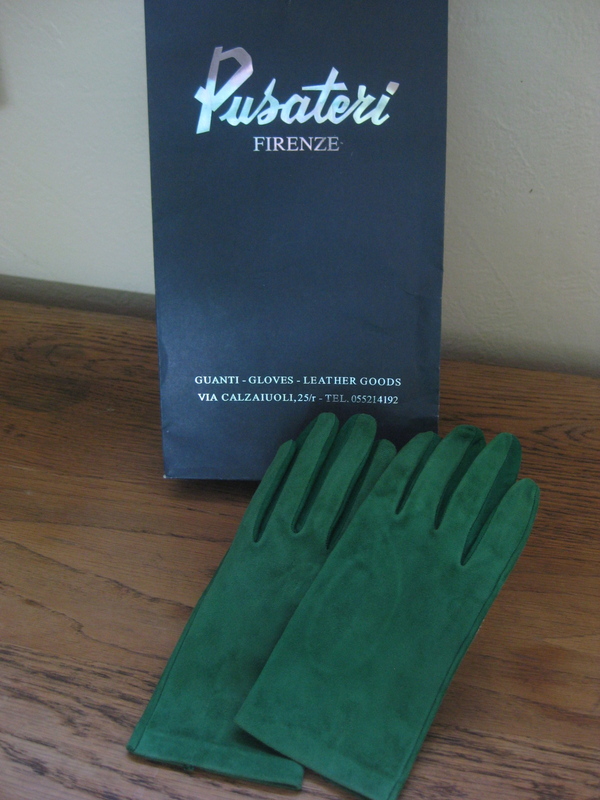 On that first Pusateri visit, I purchased a single pair of short cornflower blue suede gloves for myself — and several pairs as gifts. For example, my dear friend Roxanna received a similar pair in vivid orange, one of her signature accent colors. So, upon returning to Firenze this past summer, I had long ago determined to find out if the shop was still there, and if so, to shop a bit more strategically. While my husband, Jim, went off to paint, I walked down the street, past the Duomo, to the area where I believed the shop to have been. As I neared the end of the street and approached the river Arno, my heart began to sink. I thought that either the shop had closed or moved, and I began to fear that my desire for a glove shopping expedition might go unfulfilled this time. And then I saw it. The tiny shop with the beautiful Pusateri sign. It was still there and as full of colorful gloves as I remembered! I had to wait in line outside, as the shop will only hold two or three customers at a time. Soon it was my turn to enter, and just as before, one of the lovely ladies was eager to help me. No powder needed this time, as the weather was a balmy 78 degrees or so. But we tried several styles and colors (and re-confirmed my correct size) before I decided on three pairs: short green suede; short Mediterranean blue suede; and long chocolate brown leather. I also chose several pairs as gifts for some of the elegant girls I know, but I’ll have to wait to reveal those selections or I’d be spoiling Christmas surprises for several people. Suffice it to say that my second Pusateri shopping experience was delightful. Even more fun than the first time. And yesterday, a bit of fall was finally in the air here in Albuquerque. So I went to the ooat closet, retrieved and carefully unnwrapped one of the new pairs of gloves I’d purchased, and added a bit of colorful Italian elegance to my day.